Fisher was born in Brooklyn, New York in 1875 but moved with his family to California when he was young. His father, grandfather, and great-grandfather were artists, so talent was no doubt a family trait. Even so, he was coached as a sketch artist by his dad early on and went on to attend the Mark Hopkins School of Art to further his talents. His first commissions as a teen were with local newspapers and Judge magazine nationally. He worked at both the San Francisco Call and the San Francisco Examiner as a young man in the late 1800s. “In 1897, Fisher was given a requested transfer to Hearst’s New York American. Barely two weeks later he got a job as in-house cartoonist and illustrator for the fabulously famous Puck magazine. His career was careening ahead with recognition from everyone who came into contact with his work,” according to NMAI. Fisher was just 20 when he made the move back from California to New York. He was nicknamed “The Father of a Thousand Girls” by Cosmopolitan in 1910 and his work continued to flourish. Other artists like F. Earl Christy and Philip Boileau also drew beautiful women in the early 1900s, but Fisher was by far the most successful commercially. In fact, his illustrations graced more than 80 Saturday Evening Post covers, and he created most of the Cosmopolitan covers from 1913 until he passed away in 1934. Tragically, Fisher’s originals were appraised for very little as contemporary art and he believed that they weren’t worth saving for future generations. Upon his death, at his request, a family member kept a few of them and burned the 900 remaining examples. Thankfully, his legacy lives on through the publishing of these beautiful works. Today, the easiest way to add a Fisher illustration to a collection is to look for postcards featuring “Fisher Girls” and other lovely scenes reflecting family life. These can be found quite reasonably, $5-25 in many instances, although they are small. Folks using them as artwork sometimes frame them in groupings for a more impressive look. If you’d prefer a larger original print to begin with, snagging an antique book illustrated by Fisher, or a plate from one that has already been removed can be a good option. Many, many books by various authors contained his work in the early 1900s. 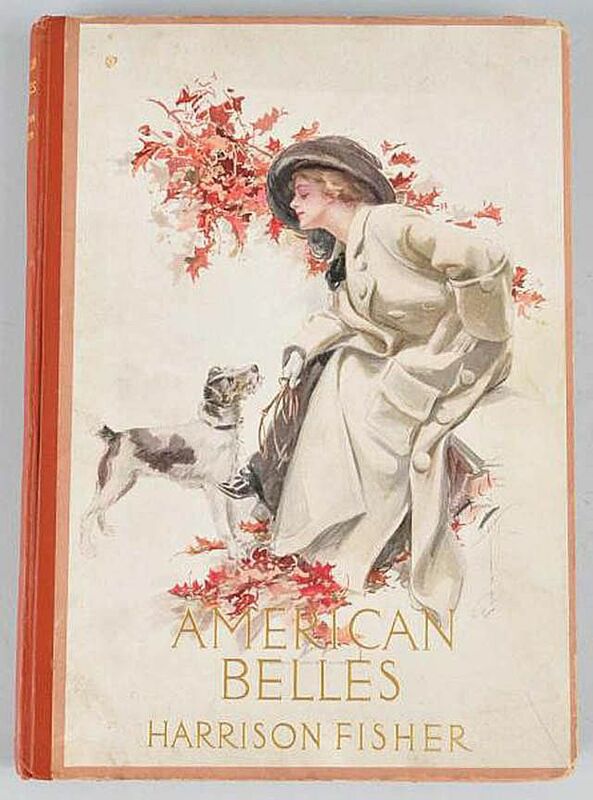 Some books, like Harrison Fisher’s American Beauties, Bachelor Belles, and A Garden of Girls, to name a few, are filled with his Fisher Girls. The plates in these books are generally printed on heavier-than-average paper so they’ve remained in good shape. A complete book will cost more than a postcard, of course, but given that they usually contain a number of illustrations, the $50-200 you’ll spend is well worth it. This is, if you can move yourself to actually destroy the book to remove the plates within. That can be hard for ardent fans of Fisher's work. There are, of course, the many magazine covers and articles that featured colorful Fisher drawings as well. These covers can be readily purchased for $10-35 in many cases. They’re more fragile though, harder to preserve, and many are in poor condition with stains, fading, and tears. They do offer the most variety, however, and can make a really impressive collection whether framed or stored in protective sleeves designed for preservation.